If, like me, you love the zingy flavours of proper Mexican food, you are going to love these! It’s another of my “salads for people who don’t like salads” recipes. Crunchy, fresh, lightly spiced, creamy, satisfying. This baby’s got it going on! This’ll mean when you spiralize it you’ll be left with nice short ribbons, rather than mile long ones. If you don’t have a spiraliser, chop or grate your apples. Toss your veggies together in a big bowl and place to one side. Pop all of your dressing ingredients into a jar and shake until combined. Give it a taste, decide if it needs more of anything. Too sweet? More lemon. Too sour? More honey. Too thick, more water. Etc. Pop to one side and make your guacamole. Mash your avocado, stir in the citrus juice, coriander and salt. Now you can cook your fish. You’ll need a filet per person, or I just got one bit one between two. Add just a little olive or coconut oil to a pan on a medium-high heat. Season both sides of your fish with a pinch of paprika, a pinch of cayenne pepper and a sprinkle of salt. Fry until opaque all the way through and don’t flip too much so you get a nice crust. Split your salad into two bowls (choose whether to toss your salad in the dressing now, or just drizzle over the top later). Smother in that delicious creamy dressing. Add a generous scoop of guacamole. A low carb, extremely healthy, highly delicious version of fish tacos that you can whip up in a jiffy! You don’t need me to tell you that cabbage is one of the best things you can eat in terms of nutrition and vitamins, especially raw like this. 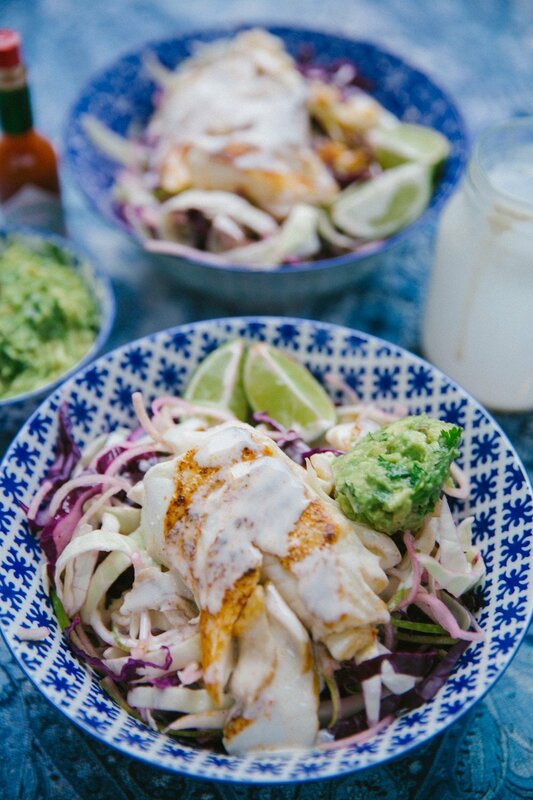 The fish is a great source of omega-3 fats and the whole dish offers up some serious brain food to get you going! Avocados are a miracle food as far as I’m concerned, great for your skin, hair, nails, joints and heart. Anyone who tries to tell you not to eat them because they’re “fatty” should be ignored. A bowl or two of this once in a while will do your gut wonders, which is of course linked to your brain and emotional well being – making it great for fighting January blues.